Show me the Apps !!! I've been griping about this for a while on and off, but I feel it's time to dedicate a whole post to this. In a nutshell, the problem is that there is no UK web based app store for the Kindle Fire (or in fact any other Android device). What this means is that for a potential customer, there is no guaranteed way to see what apps they can enjoy if they buy a Kindle Fire. For the average punter who sees Amazon pushing the Kindle Fire on the homepage and then reads about all these apps that they will be able to download they must be feeling slightly mystified as to where all these apps are. The only indication are a few popups on the Kindle Fire sales page which show a few screen shots with some app icons on them. If you already own another Android device you can download the Amazon app and browse apps from there, but like myself, I should think a significant portion will not have another Android device to do this. The only other alternative is to browse on Amazon.com, but there is no guarantee that an app available in the US will be released in the UK, and also of course the prices will not be correct. For someone weighing up the pros and cons of a Kindle Fire over a Nexus, iPad etc both of which have easily browsable web based app stores this really stinks. Also, lets not forget developers and bloggers. Many people have mentioned on the Amazon developer forums that they are unable to promote their apps outside the US because they do not have a web page to link to. Combined with regional lockouts which also means developers cannot see or comment on reviews and support questions about their apps outside territories where they have a verified Amazon account and billing method this makes it very difficult for a developer to take Amazon's offering seriously. European bloggers and sites such as this cannot link to any apps either to recommend them or as a part of a review. Developers cannot place advertisements either without resorting to suggesting a keyword search in the KF app browser. 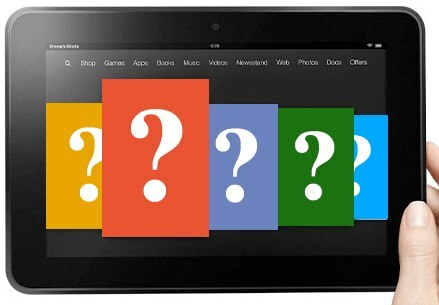 One can only imagine that there is some ulterior motive for keeping which apps you can download on Kindle Fire a mystery. Perhaps they don't feel that they can compete with Google's Play store and therefore need to mask the shortcomings. Whatever the reason, Amazon's strategy with this is all wrong and must be costing them a considerable amount in lost sales. Come on Amazon, prove me wrong and get the web store up and running already. This post was last modified: 15 Mar 2013 06:53 PM by Phil. I was looking to buy a couple of Kindle Fire HD's at christmas but really felt I was taking a gamble as I couldn't see what apps were available. I bought two Nexus 7's in the end. Well that's just plain bonkers. My books are available for sale on Amazon and Smashwords. You will also find them on Fenopy, H33t and Extreme Torrent. This is one of (but a very large) reason I opted for a Nexus 7 over a Kindle Fire. I have an open device which I can load apps on from anywhere, instead of buying tied to a particular vendor. (16 Mar 2013 11:54 AM)leep Wrote: Wrote: This is one of (but a very large) reason I opted for a Nexus 7 over a Kindle Fire. I have an open device which I can load apps on from anywhere, instead of buying tied to a particular vendor. Exactly and I've bought 2 Nexus as well. It's what Amazon DONT tell you in their sales patter that decided I look further before buying, nobody in their right mind would opt for a Fire above a far superior tablet in 9 out of 10 key area's. I took a similar route. Bought a Playbook 64gb for £120. and stuck on the Kindle app. Does so much more than The Fire, loads of free and paid for apps - including the Android offerings and proper multi-tasking.